The Centre will bring together Elan’s two decades of experience in Alzheimer’s research and its depth in biology and model systems with the University of Cambridge’s pioneering contributions in the development of biophysical approaches to study the molecular basis of protein misfolding and aggregation, and their links to disease. The University of Cambridge and Elan Corporation plc. (NYSE: ELN) today announced the launch of The Cambridge-Elan Centre for Research Innovation and Drug Discovery (Cambridge-Elan Centre), which will be located at the University of Cambridge, England. The Cambridge-Elan Centre will provide a highly interdisciplinary environment uniquely positioned for delivering world-leading translational research focused on innovative therapies for Alzheimer's and Parkinson's diseases. This ten-year agreement paves the way for a long-term collaboration between Elan and the University of Cambridge. The goal of the Cambridge-Elan Centre is to discover novel compounds capable of altering the behaviour of proteins associated with neurodegenerative disorders that can be developed into new treatments. Through the combination of unique strengths, the Cambridge-Elan Centre will enable investigators across the two organisations to explore novel approaches to improve the understanding of biophysical and biochemical aspects of protein folding and misfolding, and to explore unique approaches to modulate these processes in an effort to discover new therapeutics. Elan is a neuroscience focused biotechnology company committed to making a difference in the lives of patients and their families by dedicating itself to bringing innovations in science to fill significant unmet medical needs that continue to exist around the world. The University of Cambridge’s mission is to contribute to society through the pursuit of education, learning and research at the highest international levels of excellence. 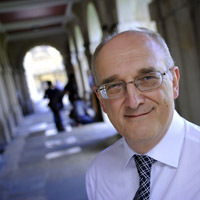 Cambridge’s reputation for excellence is known internationally and reflects the scholastic achievements of its academics and students, as well as the world-class original research carried out by its staff. Some of the most significant scientific breakthroughs occurred at the University, including the splitting of the atom, invention of the jet engine and the discoveries of stem cells, plate tectonics, pulsars and the structure of DNA. From Isaac Newton to Stephen Hawking, the University has nurtured some of history’s greatest minds and has produced more Nobel Prize winners than any other UK institution with over 80 laureates.